You can't imagine how soft the Blue Sky Alpacas Brushed Suri is until it's knit up. Oh. My. Goodness. Like a cloud, my friends. But that bit of bamboo gives it strength. I've just started my seventh repeat of the traveling leaf lace pattern on Pam Allen's Reading-In-Bed Shrug (opens the PDF), and it is so soft and sweet, though the color has an underlying dustiness that keeps it from being saccharine. 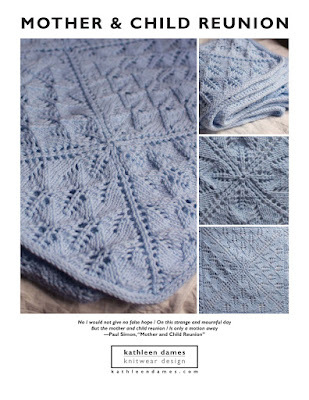 BTW, have you heard the news about Interweave Knits? Eunny Jang is the new editor! How fantastic is that. If you haven't come across Eunny's blog, please check it out. She is an indefatigable knitter and amazing instructress. Congratulations, Eunny, and I look forward to great things in future issues.